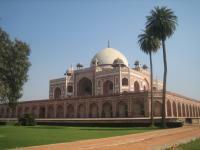 Humayun's Tomb, Delhi is a landmark in the development of Mughal architecture. 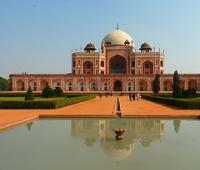 It was built in 1570 for Humayun the second Mughal Emperor of India. The architect was Mirak Mirza Ghiyath, under the direction of Humayun's widow. He used mainly red sandstone, with white and black marble inlays. The tomb and the complex around it now contains about 150 graves of ruling family members. Around the tomb is an accomplished Charbagh garden, with pools joined by channels. It was modelled after Persian and Central Asian gardens, and was the first introduction of the Garden Tomb concept in the Indian subcontinent. Humayun's Tomb was the last of Delhi's WHS that I visited. It is undoubtedly the most picturesque of all of the sites, with its perfect shapes. It is easy to see how it has influenced the Taj Mahal. But I have not become a big fan of Mughal architecture here in Delhi: the buildings were constructed to impress, but lack fine details (or maybe these have disappeared during the ages, the glazed tiles are very few now). My visit to the site lasted a mere 45 minutes, and I cannot see how I could have spend more time here (although part of the complex is fenced off at the moment). The "park" could use some more water, to make the lawns look green and fresh, and also to fill up the little canals and pools that surround the Tomb. However, as Rob Wilson already stated below, the state of the site has improved a lot over the last years. There's an exhibition on site where you can see "before" and "after" photos. This monument is the best site to see in Delhi. I went there in 2010 and was surprised to see that it was totally different from other sites in Delhi. The surrounding was clean, calm and peaceful. No hawkers, conmen, scammers etc. And the monument was magnificient. I highly recommend this site to anyone visiting Delhi. I visited this WHS in January 2012. This site is unique as it was the stepping stone to build the Taj Mahal. The architectural symmetry of the tomb and its gardens can be clearly seen also in this site. Bustling and busy Dehli can prove to be quite a challenge for the first time visitor so entering the gates of Humayun’s Tomb felt like quite a nice relief from persistent rickshaw-drivers, touts, beggars, snake charmers and other annoying elements you are confronted with. It’s a cultural shock that any European have to go through but after some weeks of travel on the Indian continent I promise that you will see them as part of a wonderful and massively colourful society that draws you back for another visit. 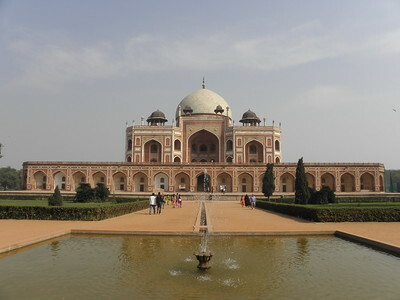 Humayum’s Tomb was built by the grief-stricken wife of emperor Humayun in 1565. It took nine years to complete the tomb and it is said to be a landmark in the evolution of early Mughal architecture and legend tells that it’s been a model for the mighty Taj Mahal in Agra. I visited Humayum’s Tomb on an early December morning when only a few visitors had entered the site and the contrast between the city and the peaceful garden and the monument was truly stunning. With several adjacent palaces and tombs, make sure you take at least some 2-3 hours to fully enjoy this wonderful place. Haunting. Mesmerizing. Unforgettable. The mythical aura surrounding Humayun's Tomb became a part of my soul the moment I laid my eyes on it, in January of 2005. That beautiful foggy winter morning in New Delhi is indelibly entrenched in my heart... as the day I came across perfection. I have visited the tomb twice. Once in 2002 when it was a fairly horrific state of repair. I returned last summer and am pleased to say that the ASI have done a magnificent job of restoring this wonderful old tomb. It is surely one of the most evocative tombs on Earth. It provides a moments peace from the madness of Delhi and is even more interesting if you know about the extraordinary life of Humayoun himself. Surely One of the most beautiful tombs in the world. I visited Back in 1993 and am still regreting of not wandering around the tomb a little longer..
Chahar Bagh Gardens: Humayun's "father, Babur, is credited with having introduced the Persian Chahar Bagh to India. Humayun's garden is a geometrically perfect example of the genre but differs from Babur's gardens in having a building at its centre. This makes the garden into a setting for a building, rather than a place to be enjoyed from a pavilion. The garden symbolises the emperor's place in paradise. It was not the first example of the type, but it is the oldest to survive in good condition. The garden is divided into 36 squares by a grid of water channels and paths"
Minor modifications after inscription: 2016: to include Mirza Muzaffar Hussain’s Garden Tomb (3.34 ha); an unknown Mughal garden tomb (0.82 ha); Sundarwala Mahal Garden Tomb (0.37 ha); Sundar Burj Garden Tomb (0.23 ha); Nila Gumbad’s Garden Setting (0.37 ha); and Lakkarwala Burj Garden Tomb (0.31 ha). 223 Community Members have visited.